1. Click the Add User button at the top of the Users & Groups screen. 2. On the Add a User page, enter the user’s information, as shown below. 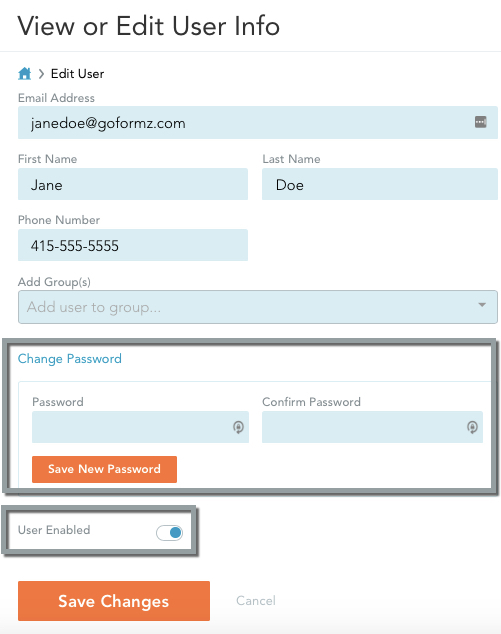 Notice that in addition to entering the user’s name, email, phone number and password, you can also add the user to any number of groups. To do this, simply expand the Add Group(s) dropdown and select the groups for this user. In this example, Jane Doe will be added to the “Eastern Region” group. 3. Click Create User when done. The new user will be created, GoFormz will automatically open the new user’s page in case you wish to modify any settings, and you will see a message at the top confirming that the user was created successfully. When adding new users, you will not be allowed to exceed the number of licenses in your account subscription! See here for information on how to increase your subscription count. To change the user’s personal information, simply edit their email address, name or phone number in the appropriate fields. To add the user to a group, select the group from the Add Group(s) dropdown. In the example below, Jane is being added to the “Boston” group. To remove the user from a group, click Remove next to the group name in the Current Groups section on the right. In the example below, we can remove Jane from the “Eastern Region” group. Click the Save Changes button at the bottom to complete your edits. To change the user’s password, click the Change Password link, then type in the new password twice, and click Save New Password to make the change. To deactivate the user, click the User Enabled slider, then click Yes in the confirmation dialog that appears. See below for more on deactivating/reactivating users. If you change a user’s email address and/or password, make sure to communicate this to them, because they will need this information to log in! Whenever you edit a user’s information, you will see a confirmation message at the top of your browser window. Active Devices: These are devices that are currently logged in and in use. This means the user can open the app and start using it without giving their login information. Each user is limited to 2 active devices. 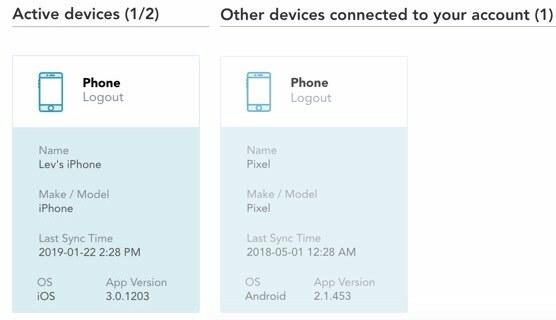 Other devices connected to your account: These are devices that are still logged in but not currently active. This means the device was never logged out, but you have to re-enter your login information in order to start using the app (unless it is within an up to one-hour window of becoming inactive). This may happen, for example, if the user is already logged into two devices, then logs into a third device, and chooses to deactivate one of the two active devices when prompted. The deactivated device will show on this list. Note that all devices listed here are logged in, the distinction is whether they are active or not; logged out devices will not appear on either list. To force a device logout, click the Logout link at the top of the device info box. The device will be removed from the list. If a user is actively using the device, they will be logged out within five minutes and redirected to the GoFormz login page. You may want to use this force-logout functionality when a device is stolen or an the employee associated with the device is let go, for example. Doing so will prevent anyone from accessing your GoFormz account data from the device. You cannot delete users in GoFormz, but you can deactivate them. This means that the user will no longer have access to their account, but their information will still be saved, so that they can be reactivated later if needed. To deactivate a user in your account, just find the user and click the slider in the Enabled column to toggle it. Then click Yes in the confirmation dialog that pops up. 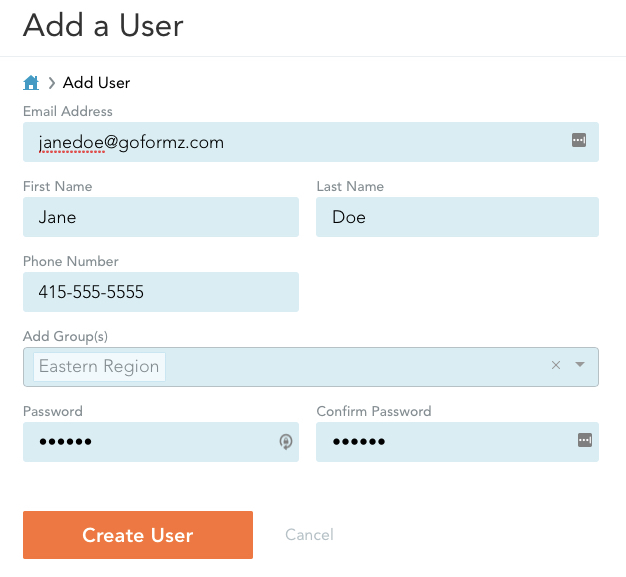 To reactivate an inactive user, you must contact GoFormz support. So be careful when deactivating users! You can identify deactivated users in the user list by looking at their Enabled column. Deactivated users will have the slider toggled to the left and greyed out. In the image above, user Jane Doe has been deactivated.